General TV Channel / National Communications Network (NCN) is a national, state-owned television and radio broadcasting corporation in Guyana. It was formed in 2004 through the merger of the government radio service, Guyana Broadcasting Corporation (GBC), and the government-run television service, GTV. NCN's studios are situated on Homestretch Avenue in Georgetown. 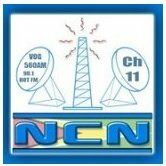 NCN runs three radio services: Fresh 100.1 FM, re-branded in 2012, formerly Radio Roraima (formerly Channel 1), which uses the radio frequency 760 AM (760 kilohertz on the medium wave band; no longer broadcasting); Voice of Guyana (formerly Channel 2), which uses the radio frequency 560 AM (560 kilohertz on the medium wave band); and an 102.1FM service — Hot FM — which uses the radio frequency 98.1 FM. All three services are controlled by the government. NCN's television service is broadcast on Channel 11 in Guyana, with various regional channels in Berbice, Essequibo, Linden and Demerara.